The Ford Fusion is a hometown favorite around here. So many are on the roads in southeast Michigan that you’re forgiven for thinking Ford’s midsize sedan outsells the Honda Accord, Nissan Altima, and Toyota Camry (it doesn’t). 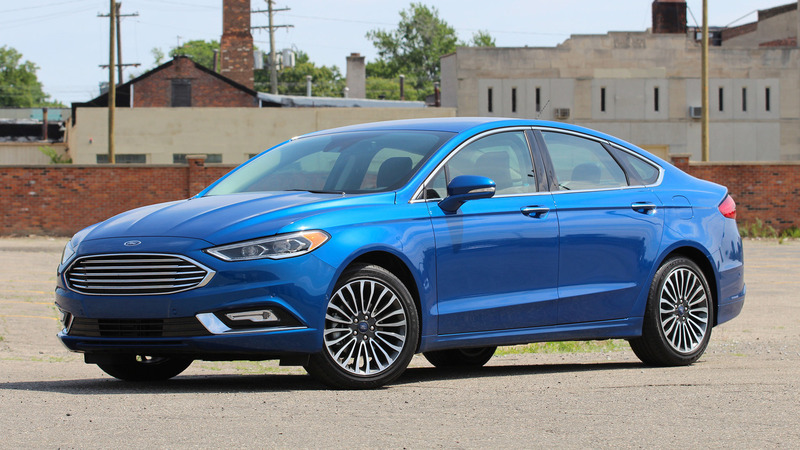 Blue Oval worship aside, there are good reasons for the Fusion’s popularity. For starters, there’s a Fusion to meet every need: Cheap S, fully loaded Platinum; front- or all-wheel drive (more on that later); even Hybrid and Energi variants for the eco-minded. The Fusion has also always been one of the class’s best-driving entries, a pleasant reminder that everyday cars need not necessarily be snoozers. The 2017 Ford Fusion brings more of the same in a fresh wrapper. The much-lamented, curmudgeonly MyFord Touch infotainment system has been evicted, the fascias and sheetmetal have been nip-tucked, and a super-cool rotary shifter headlines the redesigned interior parts. Put it together, and there are as many reasons as ever to like the Fusion. I remember being struck with the look of this generation Ford Fusion when I first saw it at a press preview in December 2011, and the refreshed 2017 still catches my eye. Where so many midsize sedans have bland, amorphous shapes, the Fusion wears its straight lines and hard edges with pride. The tighter front end and resculpted tail make this one of my favorite sedan designs in the class. Oh, and it no longer looks quite so much like an Aston Martin from the front. My only gripe: That giant chrome strip on the trunk is so 2002. In a segment where we readily acknowledge that most cars are dull, the Fusion drives extremely well. I’m impressed with how little road or wind noise enters the cabin on 80-mile-per-hour highway cruises, and how well the suspension dispatched with road imperfections before I felt them. The 2.0-liter turbo engine is a riot, too, right up there with some of this car’s V6-powered rivals. Nobody needs this much power in a family sedan, but I quickly got hooked on using all 275 pound-feet of shove. (And if you really need more oomph, there’s a 325-hp Fusion Sport model to choose from.) Best of all, the electric power steering feeds road information back to your hands, a rarity among the Fusion’s rivals, making it just that more satisfying to steer. Offering all-wheel drive is a really nice point of distinction in this class; the only other midsize sedans with AWD are the Subaru Legacy and the soon-to-be-discontinued Chrysler 200. 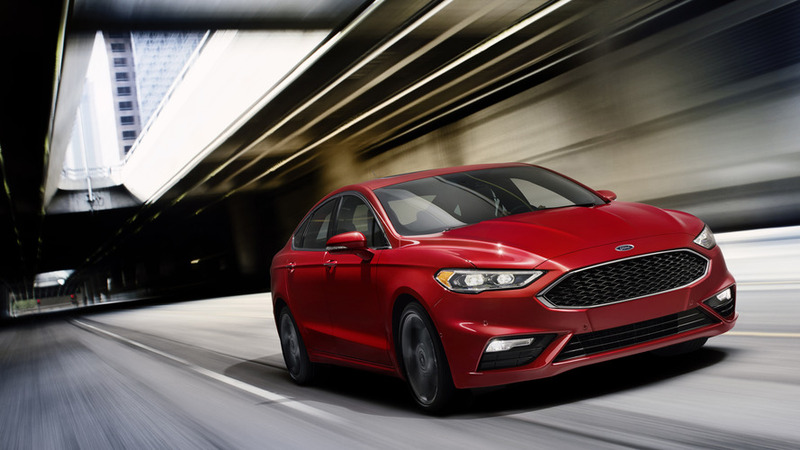 On the Fusion, AWD is available as an option on with the 2.0T engine on the SE, Platinum, and Titanium models, and comes standard on the gutsy Sport. My test drive on dry, warm roads never let me put the Fusion’s AWD to the test, but extra winter (or dirt-road) traction is surely an incentive for buyers to shop Fusion rather than moving up to a crossover. Now as ever, the Fusion’s back seat disappoints. Objectively, rear leg- and headroom aren’t too far off the segment average, yet my legs feel cramped and awkward back there. That’s primarily due to the sloped seat cushion that produces a knees-up posture for passengers. Spend some time in the back before buying if you plan to regularly carry four adults. Ford has no problem building functional interiors, with every control arrayed exactly where you’d expect and need it. What’s disappointing about this loaded-up Fusion Titanium, though, is a lack of design flair inside the cabin. The dashboard and center console are made from huge slabs of plastic with little in the way of curves or color flourishes to draw my eye. Aside from the cool new shifter, there’s not a lot that wouldn’t be out of place in a 2013 Fusion. Going for the all-wheel-drive Fusion brings a hefty fuel-economy penalty. Some highway driving netted me an indicated 27 miles per gallon (below its 29-mpg EPA rating), but in urban driving I was closer to the EPA city figure of 20 mpg. Those figures are competitive with the six-cylinder Subaru Legacy (which matches the Fusion 2.0T AWD at 20/29/23 mpg), but it’s worth remembering if you’re looking for a fuel-sipping midsize sedan. Less powerful, front-drive rivals easily push high into the 30-mpg range on the highway. If you need all-wheel drive with high efficiency, there’s the four-cylinder Subaru Legacy, which rates 26/36 mpg in EPA testing.